Acrobat 2017 is the latest perpetual desktop version of Acrobat. It simplifies everyday PDF tasks and includes many productivity enhancements when working with PDFs from your desktop. Acrobat DC is the latest subscription version of Acrobat. With Acrobat DC, you always have the most recent version of Acrobat software with the newest product innovations and tools for desktop and mobile. It includes all the functionality of Acrobat 2017, plus you never have to purchase upgrades again. Organize pages in PDF files from your iOS or Android tablet or smartphone. Compare two versions of a document to detect all text and image changes. View an easy-to-scan results summary that provides an overview of file differences. Easily move through the document to review each difference using a side-by-side or single-page view. Filter the changes to quickly see all text, image, annotation, formatting, header/footer, or background differences. Note: This tool was previously named Compare Documents. Acrobat displays the results in a new document that provides an easy-to-scan summary of all file differences. 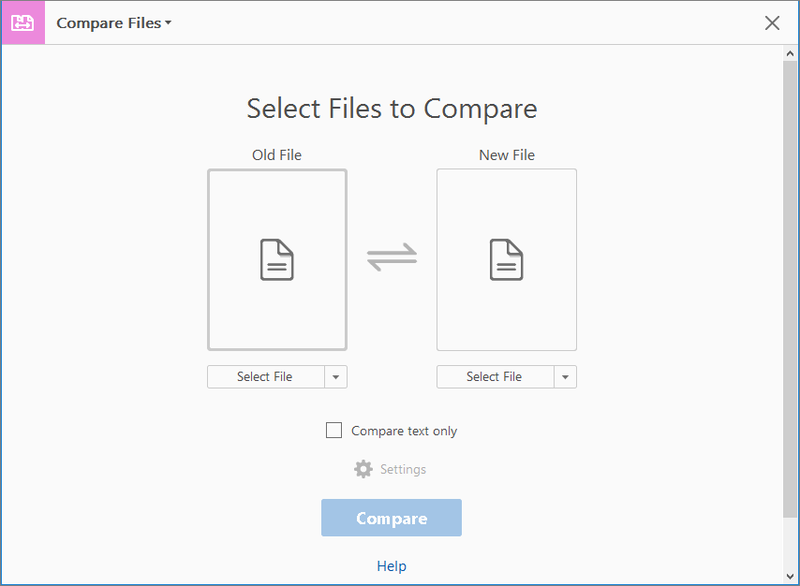 Click the Go to First Change button to begin reviewing each file difference in detail. For more information, see Compare two versions of a PDF file. Acrobat now shows bulleted list and numbered list controls in the Edit PDF Format panel. You can now create new bulleted and numbered lists, convert an existing paragraph a bulleted or numbered list, revert lists to regular text, and convert lists from one list type to another. Acrobat now also detects additional bulleted and numbered list types in your document, if any, and shows them at the bottom of the related list pull-down menu, separated by a thin gray line. You can also use your keyboard to add a list item. For example, before a paragraph, you can type number ‘a’ followed by the closing parenthesis ‘)’ and then add one space. Acrobat automatically inserts a numbered list starting with “a)”. The Scanner tool now has a new simplified interface. The new interface makes it easy for you to quickly scan paper documents to PDFs using the default settings or a preset option. It also makes it easy for you to fine-tune scan settings from the same interface using radio buttons, a gear icon, or both. To access the Scanner tool, go to Tools > Create PDF > Scanner. For more information, see Scan documents to PDF. The all-new Certificates tool makes it easier than ever to digitally sign, certify, and verify documents with a digital ID. Get set up easily. Find your existing digital IDs from files, smart cards, or USB token devices and configure them easily for signing. Customize your signature appearance. Add valuable information to your signatures, such as a logo, date, location, or signing reason. Use your signature image. Draw your signature or upload a scanned image to add it to your digital identity. You can use existing digital IDs or create new ones. 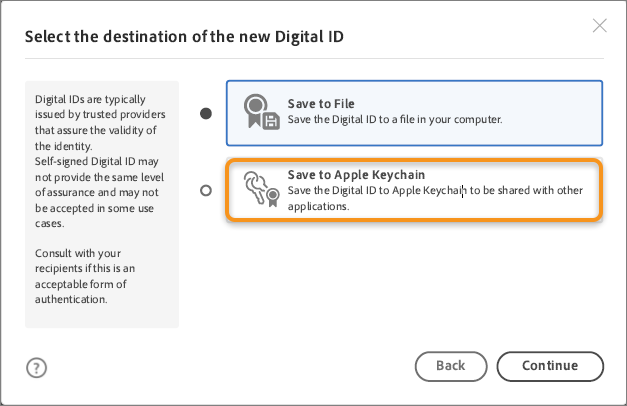 Based on whether a digital ID is available on your machine or not, you will see one of the two workflows described below. When you create or click a signature field and no digital ID is available, you see the following prompt. Click Configure Digital ID. 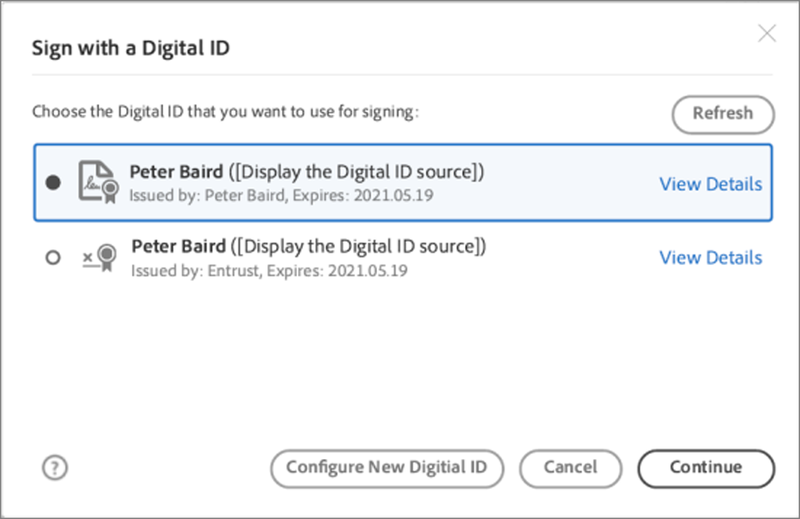 The Configure a Digital ID for signing dialog is displayed. 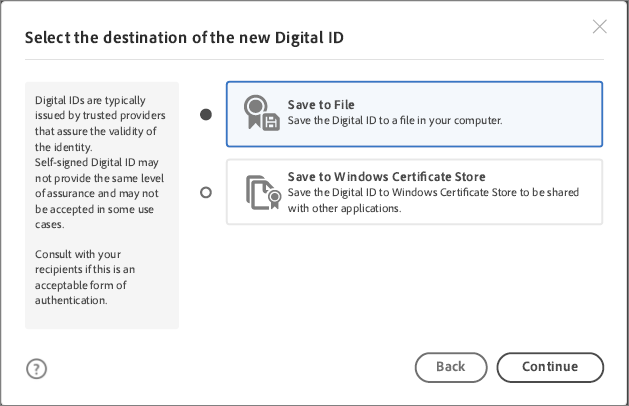 Select the type of digital ID desired, click Continue, and then follow the wizard to create the ID. If you select Create a new Digital ID, the next set of options are displayed based on your Operating System. 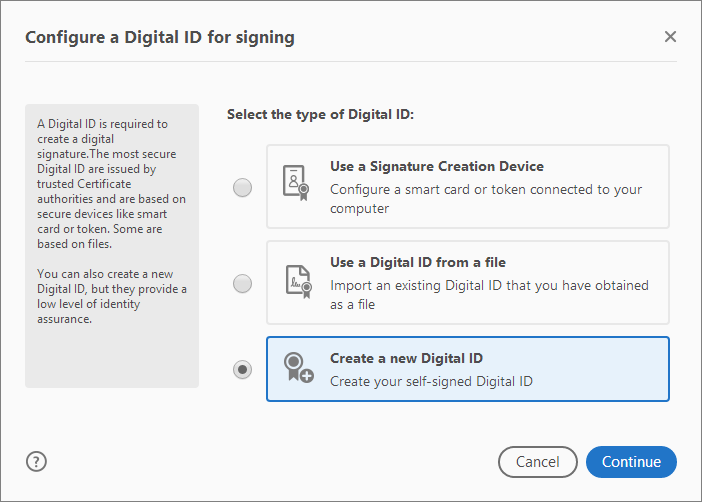 When you create or click a signature field and one or more valid digital IDs are available for signing, you see the following dialog box to choose your preferred digital ID. Select the desired ID and continue with the signing. For more information, see Digital IDs. Use the enhanced tools search in the right-hand pane to quickly find the tool you need to complete a given task. Now you can initiate and participate in SharePoint-based shared reviews on Mac to give and get feedback quickly. For more information, see Hosting shared reviews on SharePoint or Office 365 sites. In addition to the Light Gray theme, Acrobat and Acrobat Reader now has a new Dark Gray theme, which is in line with other Creative Cloud products, such as Photoshop, Illustrator, and Premiere Pro. This theme provides an attractive visual experience, especially when working with rich colors and designs. It also makes cross-application work simpler than ever. By default, the theme continues to be Light Gray. To change it to Dark Gray, go to View > Display Theme > Dark Gray. Give and get fast, clear feedback with all-new commenting tools and an intuitive, touch-friendly interface. Customize the comment toolbar to see the features you use. Easily change the color, font, or size of comment text. Easily view and navigate through comments. You can organize comments by page, author, date, type, checkmark status, or color. Filters also support quick management of comments. Reply to sticky notes with a single-thread that presents all replies to an annotation in one conversation. Tap on fillable text fields to bring up the soft keyboard on touch-enabled devices. Use keyboard shortcuts for commenting actions, including delete, replace, or add a note to text. When you open the Comment tool, the text markup shortcuts are enabled by default. Use the new highlighter pen to mark up scanned documents without needing to run OCR. Easily discover and modify text highlight color - the Color Picker is available on the Comment toolbar. Text formatting tools appear automatically for typewriter and text box tools. The moment you click anywhere on a page, the Text Properties pop-up menu appears below the Comment toolbar. Page-based organization in the comments pane. Each annotation is now equivalent to a conversation and all replies appear like a single-thread experience. Acrobat now supports Microsoft’s new DirectInk technology. It enables you to use your finger or a hardware pen to draw and write more smoothly on PDFs on Windows 10 devices.